It's the time of the year again! Chilli powders will be up for sale from 3rd Dec 2011 to 31st Dec 2011. 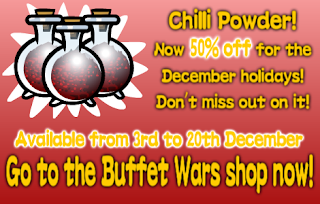 To celebrate this festive season, Chilli powders will be on 50% off! There's no better time to stock up on your supply than now! Here's the guide to the sale for those who are new. It is exactly the same as the previous sales. For more information, you may discuss with other players in the Item Upgrading Discussion thread. Each preservative allows you to protect your item's upgrades at +4, +6 or +8. They are used up only if your item fails its upgrade. The maximum upgrade for any item is +10. Once you reach +10, no further upgrades will be allowed. To help with your upgrading efforts, we have bundled the Chilli Powder and Lucky Jam together at a lower price, and will give a FREE +4 Preservative for each bundle purchased. Get this package if you're going to do any serious upgrading!! This bundle will be available ONLY during the sale period. The awards for successful upgraders are also available! Caution: The +10 Upgrader Award will be extremely rare as chances of success at such high levels are very very low. We usually recommend against trying beyond +8 if you do not own any +8 preservative. The success of any upgrade is NEVER guaranteed. There is always a variable success rate for each upgraded level which gets lower with each level of upgrade. As a guideline, chances of success for each upgrade beyond +5 is always less than 50%. It is possible to keep failing, it is also possible to keep succeeding. It is all based on luck! Use your Chilli Powder with caution and know when to stop. Being too rash or greedy may end you up with +0 and no Chilli Powder left. 5 copies of Diner Remix to be won!